I made this Koala Cake for my daughter’s 2nd birthday. Her favourite toy is her Koala which was bought by her grandparents after their trip to Australia. The cake is made up of two chocolate cakes and two small muffins. The recipe below is enough for this cake! You do need a very big bowl! Put all in a bowl and use an electric mixer until it goes lighter in colour. Cook for approx 35-40 mins or until it begins to come away from the sides of the tins. I made one round cake and one square cake. I then cut the corners off the square cake and rounded it off. Two of the corners were used for the ears, the muffins had a little cut off and put them together to make an oval shape for the nose. I then used the other corners and the bits cut off from the muffins for the paws. 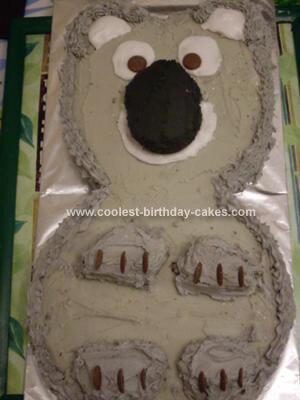 To ice the Koala I used butter icing which I coloured grey. Keep some back to colour black for the nose. You must make sure the icing is soft so you can spread it! Use an electric mixer for this, I stupidly did it by hand as this is the first cake I had made and iced, I didn’t realise you could use a mixer for this as well!! Once the main cake was iced I made up some standard glace icing which I used for the eyes and ears and then chocolate buttons on the eyes and for the claws. I then piped butter icing around the ears and the body to look a bit like fur! I am hoping my daughter will recognise this cake as her Koala (lala as she calls it) and I hope others have fun having a go! This cake will feed approx 15 people, maybe more depending on the sizes of your portions! !